Bill Vidal was born in Argentina and educated in England. He lived and worked in the USA, South America, the Middle East, South East Asia and Europe before settling with his wife and twin children in East Kent. In recent years he has slowed down his business commitments to devote more time to writing and to his lifelong love for aeroplanes. 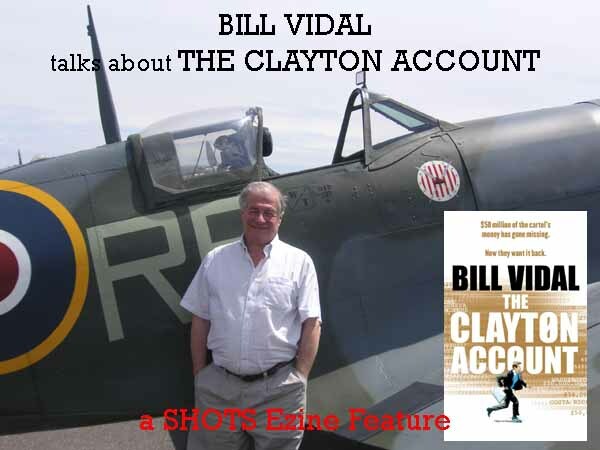 Bill's articles about flying have been published in leading newspapers and magazines. The Clayton Account is his first novel. I was in my office last week when Special Branch popped in. That in itself was not unusual – my office is in an airport and since 9/11 anyone involved in aviation is subject to regular scrutiny. It’s what happened next that amused me. A visiting friend announced the impending publication of my first novel and the police officers wanted to know all about it, including the inevitable question, did I write it from personal experience? That produced a few laughs, and two copies of The Clayton Account on back order for our plainclothes friends. I imagine that all novels are a mixture of a writer’s experiences and his or her own imagination. In a career spanning three decades in international trade, I lived and worked in many exotic places where crime – especially large scale crime - was often so prevalent you’d have to be blind not to notice and abnormally insensitive to be totally unaware. Corruption is perhaps the most evident. The developing world’s wheels will simply not turn unless lubricated by copious quantities of cash. But do not dismiss corruption as a third world issue: those paying the bribes usually spring from our side of the fence. People often ask me whether I used to be a banker and the answer is no. But banks – public and private - were my clients. I attended top management meetings and, more significantly, spent countless evenings dining and wining with their directors. I sometimes shake my head in disbelief on recalling some of the stories I have heard. A few years ago I stopped working – “retired” would be wrong word. I was in my early fifties and not about to call it a day. I turned instead to my two passions: flying aeroplanes and writing. I also started writing about flying and one magazine, Today’s Pilot, gave me the space. My regular Going Places feature focuses on the attractions of individual European destinations and includes technical information of interest to pilots. But my real interest has always been the novel. Years jetting about the world in my previous job meant stacking up with books at airports. I read mainly thrillers and ventured I could write one. Deighton, Le Carre, Forsyth, Clancy, Grisham. You name them, they kept me company in far-away hotels and long-haul flights. I started to write fiction twice but abandoned both projects as life got in the way. As the idea of quitting work started to germinate I took myself back to college: London University’s Birkbeck College is geared for students in full-time work and holds its lectures in the evening: Four years later, I left with a BA in Spanish and Latin American Studies. The course was mostly literature and invaluable. It taught me to understand the novel and its possibilities in ways I may have never fathomed on my own. I plotted The Clayton Account around the world’s largest criminal activity: the trade in illegal drugs, specifically cocaine. The business is so vast that if it were brought to a sudden halt some countries’ economies would simply collapse. The banking sector, currently reeling from the aftermath of their sub-prime adventure, would watch in anguish as a trillion dollar business vanished from its books. Such is the power of the drug trade that many police chiefs have called for the complete decriminalisation of drugs as the only way to put an end to an activity that drains away almost half of all law-enforcement resources. Some years ago I had to purchase 125 grams of pure cocaine. Quite legally, with a Home Office licence. I was buying it for a plastic surgeon friend in Dubai who used it as a local anaesthetic. The little bottle cost me £14. Sold illegally, it would have fetched £8,000. The difference between those two sums is the gateway to the opulent lifestyle of the drug lord. On occasion, in my travels, I’ve met “farmers” whose South American smallholdings – two or three hundred acres at a time – somehow failed to explain a lifestyle that a million-acre cattle baron would struggle to attain. Lavish mansions, cars, boats, planes blatantly displayed, the source of funds cleverly disguised by lawyers, bankers and complicit governments, supported, when necessary, by threats and bribes. I’ve known of household-name companies securing contracts with undisclosed commissions paid through friendly banks, and learnt of briefcases full of dollars delivered to corrupt judges to secure the outcome of a hearing. So, to answer my friends from Special Branch, there’s always a bit of personal experience in a novel. But I shan’t be assisting you with your enquiries in this instance. I thoroughly enjoyed writing The Clayton Account and I feel very fortunate to have Random House behind it now. I’m currently working on another thriller. I don’t want to say too much about it at this stage. Besides, I don’t think I can. I’ve created the main characters, I know what they want and what they are up against and I know how I would like the story to end. But I shan’t know the entire plot until I see how the characters react. I can say that the story is set in Spain, Russia and Latin America and populated by an international collection of thugs and criminals as well as, I hope, thoroughly likeable individuals. And the historical facts on which it is based are real enough, but if, perchance, the true nature of what happened should clash with the way I want things to have happened, I shall use the fiction writer’s prerogative: I shall make it all up! Writing and flying. That’s my life now. I can’t help feeling guilty when I call it work.